This is when I think it starts to get exciting. Actually seeing/creating what the guitar will look like. Many of the measurements need to be specific to the scale guitar I'm building, but many of the curves are open to creativity. Lots of measuring and drawing here. 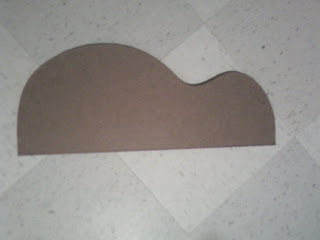 I cut this out with a scroll saw and then used the belt sander to smooth out the curves a bit. The final shape. I think its pretty good, I may smooth out the bottom of the guitar a little more, but really would like a bottom end sound that a large cavity provides. Using the template to create a working board. Hope you can see the shape drawn-out, it's very faint lines. 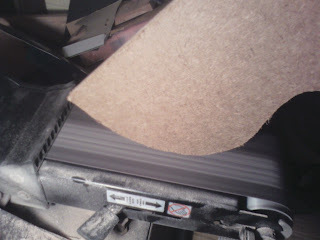 I'm using a 3/4" plywood sheet, but I need another one to make the work-board 1.5" thick. I'll see if can get another pallet top donation. (thanks vp shipping!) 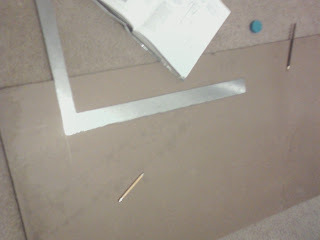 Then i will cut out the work-board. Also I will probably measure out where all the braces go tonight and put drill hole indicators on the template board I created. That will make transferring to the soundboard and back quick and easy. 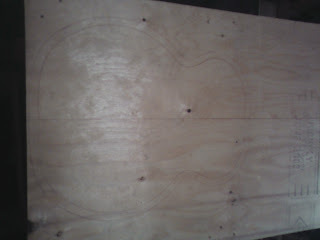 I'm at the point now where I either start working on the fret-board or the sound-board and back. Haven't decided what I want to do, or should I say which process scares me least.